In fact, the most effective prayers may not require any words at all. Modern science is just beginning to understand an ancient mode of prayer that was left to us 2,500 years ago. When you discover this forgotten wisdom, you will awaken your power to bring wellness, abundance, health, security, and peace to your life. to heal your life on every level. “Gregg Braden is a rare blend of scientist, visionary, and scholar, with the ability to speak to our minds, while touching the wisdom of our hearts.”— Deepak Chopra, M.D. Is it possible that the secrets of our spiritual traditions and the mysteries of science could actually be one and the same thing? Could there be a forgotten wisdom from a lost mode of prayer that allows you to heal your body and achieve your life’s goals? You’re about to go on a journey where science and miracles are merged into a new wisdom—and lead to a startling conclusion. Principles recognized only recently by quantum physics prove that instructions left to us in a 2,500-year-old scroll can bring healing to our bodies and peace to the nations of our modern world! Perhaps it was Einstein’s understanding that laid the foundation for an entirely new view of our relationship with space and time that emerged in the 1920s. In addition to past, present, and future, quantum physics identified a fourth component of time. This component, which is called vertical time, occurs in the present moment. To help convey the concept of vertical time, picture a wavy line moving from left to right. Then place another wavy line directly above it, then another, and another, etc. Now picture a single vertical line that intersects each of the others. According to quantum physicists, the vertical line represents a single moment in time that has many, many horizontal layers. A different possibility or outcome exists within each one of the layers. The events in your life play out a little differently, depending on which layer you’re in. In essence, this new view of time says that in every moment of your life, there are many, many possibilities that already exist. The way you experience any one of those possibilities is through the choices you make. Although scientists have only recently begun to understand this phenomenon, the 2,500- year-old scroll I mentioned earlier describes precisely such possibilities. It also describes the science of how we can choose which future we experience. An ancient scroll and modern science suggest that you are never locked into a particular outcome. If you don’t like the road you’re on, you can make the quantum leap to the road that is leading where you want to go. In other words, you can actually claim the experiences you want for yourself. Prophecy and the Dead Sea Scrolls. As a fellow seeker of truth, you’re probably quite familiar with two universal spiritual themes. The first is that all of creation is related through an unseen force. And the second is that our inner world influences our outer world through this invisible force. Well, in the 1990s, Western science began to confirm, under laboratory conditions, what ancient texts and metaphysics have been saying for hundreds and hundreds of years: We are, in fact, surrounded by a field of energy that responds to our inner world. These experiments are absolutely shaking the foundation of Western science. The following three experiments will give you an idea why. In the early 1990s, a Russian scientist named Valdimir Poponin conducted an experiment to see if human DNA has an effect on the world around it. Next, the researchers placed human DNA in the tube to see if it had any effect on the photons. And guess what? The photons abandoned their random pattern and aligned themselves along the axis of the DNA. To complete the study, Poponin removed the DNA from the tube, perhaps assuming that the photons would fall back to their original pattern. But they didn’t; they remained ordered as if the DNA were still there! In the second experiment, the Institute of HeartMath tested to see if isolated DNA would respond to changes in emotion. In this case, the researchers used a group of people who had been trained to generate coherent emotions at will. They were trained to feel compassion, love, or forgiveness on command. And they could turn that emotion around and feel anger, hate, or jealousy at the drop of a hat. The experiments were designed to determine the specific effects different emotions had on DNA, and what that means in our bodies. The researchers found that when in the presence of love, understanding, compassion, and appreciation, the twin strands of DNA began to relax and elongate. And when in the presence of negative emotions, the DNA strands tightened like a top. What’s particularly interesting about this is that the researchers found that when DNA is relaxed and elongated, the body is better able to heal itself. The United States Army Intelligence and Security Command (INSCOM) performed this experiment in 1993. This time the researchers took DNA from donors and placed it in a device that can measure changes in DNA. The DNA samples were placed in one room while the donor was placed in another room of the same building. The donor was then shown humorous videos or images of graphic violence to elicit emotional responses. And what they discovered is that when the donor was having an emotional response, his DNA, which was in another room, was having a response in the very same instant. Now conventional wisdom tells us that somehow the donor’s emotions were transmitted from one room to another—similar to the way a television signal is transmitted across a room. But when you transmit energy, typically it takes time to get from point A to point B. In other words, there’s a lag time. But, in the INSCOM experiment, there was no lag time. The researchers decided to take things a step further to see just how far these effects occurred. So they separated the DNA and the donor by as much as 400 miles. Amazingly, the results were duplicated—there was no lag time. We now know that human DNA has a direct and measurable effect on the matter that makes up our world. When we feel emotions, we have a direct effect on the DNA that is having a direct effect on our bodies and the world around us. Different emotions have different effects on our DNA and our body. Positive emotions like love, compassion, and appreciation exert a healing effect on our body...and thus on the world around us. We now know, once and for all, that each of us is connected through an energy or force that exists everywhere all the time. We affect the world around us, both near and far, through this non-local energy. These exciting discoveries are the keys to a forgotten wisdom that can help you live a more prosperous, joyful, and peaceful life. Believe it or not, there was a time, long ago, when we already knew these truths. In our hearts, if not in our heads. Our most cherished traditions tell us that there was time in our ancient history when “the wisdom of the heavens” was given to the family of man. We were told how we relate to God and the forces of creation, the world around us, and one another. Our ancestors accepted what they were told and worked with these relationships to heal their bodies, improve the conditions of their lives, and maintain peace in their communities. And so it went for hundreds of years. But then the chain of knowledge was broken and many of the traditions that had been held so dear were lost or forgotten. And without a map to follow, humankind starting walking a new path. What happened to knock our ancestors off their course? The first was when the Great Library of Alexandria was destroyed in 48 B.C. This library was created for the sole purpose of preserving all of human history under one roof. Unfortunately, over 532,000 of some of the oldest documents of all time were destroyed in a fire during a civil uprising. The second great break came during the religious persecutions after the crucifixion of Jesus. In A.D. 325, the Western biblical text as we know it today did not exist. There was only a loose assemblage of manuscripts. Some of them were poorly written. And others were so mystical that even the scholars of the time had no idea what they meant. So a council of men threw out some of the manuscripts and edited others before compiling them into the books of the Bible we know today. The gaps left by these losses cut wide and deep. Today our spiritual and historic beliefs, as well as our scientific principles, are based on incomplete records. But the news gets better: Much of the information was recovered during the 20th century. One of the great finds occurred between the years of 1946 and 1959, when a series of scrolls, documents, and parchments were found along the shores of the Dead Sea caves. Over 25,000 fragments were discovered and eventually pieced into approximately 900 scrolls. Within these scrolls were the oldest recorded documents of several of the original books of the Bible. In other words, those documents, known as the Dead Sea Scrolls, provided perhaps the most detailed information about our biblical history that we’ve ever known. The Dead Sea Scrolls were just a few of the documents that were recently recovered. And although they were all written in the language of another time, these ancient texts reveal the very secrets that are being confirmed by scientists today. Speaking the Lost Language of God combines the “wisdom of the heavens” with the groundbreaking discoveries of modern science to bring us a radical new understanding of prayer, time and space relationships, and how we relate to our world. The program shows how you can use coherent feelings to create the reality you desire. It walks you step by step through the process of how a genuine feeling affects the world around you. This process is backed by experimental evidence—there’s no guesswork or mystery involved. The program also shows you how to choose the quality of your emotions, feelings, and thoughts so you can make the leap from one future possibility to another. And Speaking the Lost Language of God gives you detailed instructions for incorporating a long-forgotten wisdom into your daily life, one of the next subjects we’ll explore. But before we do, let me tell you more about your guide, Gregg Braden. Gregg Braden is a New York Times best-selling author who has been a featured guest at international conferences and media specials exploring the role of spirituality in technology. For nearly two decades, Mr. Braden has journeyed into the remote mountain villages, monasteries, and temples of Tibet, Peru, and Egypt to study ancient texts and spiritual traditions. His extensive knowledge of ancient texts, coupled with his background in hard sciences (he used to be a geologist and computer systems designer), uniquely qualify him to bring the benefit of long-lost traditions to the forefront of our lives today. He is now considered a leading authority on bridging the wisdom of our past with the science, medicine, and peace of our future. Today, he splits his time between northern New Mexico’s mountains and south Florida’s coasts with his family between their travels. Speaking the Lost Language of God is a powerful blend of true-life stories, leading-edge science, ancient text, and direct experience. That’s what sets it apart from anything else I’ve seen. Just think of what you could accomplish if you knew the precise language the ancients used to improve their lives. Imagine what it would be like if you could heal your body or play an active role in contributing to the peace of the world. Now, I’ve already touched on the non-local field of energy that pervades our universe. Some call this force the Mind of God. Until recently, one of our greatest mysteries was determining if this force actually exists. Now that science has proven that it does, our next question is, What is it made of? To answer that question, it’s best to start with the basics of matter. We are all, at our most fundamental level, vibrating particles of light. These vibrating particles create patterns that become the atoms that make up the molecules of rocks, plants, animals, you, and me. Well, the Mind of God is a highly refined form of vibration that is everywhere all the time. It is a field of conscious and intelligent energy that responds to genuine states of human emotion. As the three experiments I discussed earlier prove, your emotions and feelings have a direct and measurable effect on the world around you. You see, there’s a constant dialogue going on between your heart, your brain, and this intelligent energy field. The dialogue within your body creates effects that extend well beyond your body. The Mind of God is the conduit. You’ll have a better idea of how to put this intelligent field of energy to work for you if you understand that it is a hologram. A hologram is a pattern in nature in which every piece of the pattern has everything it needs to reproduce the entire pattern all over again. If you make a change anywhere in a holographic pattern, it is mirrored throughout the entire pattern. The reason this is important is because we are holographic in nature. Our consciousness, beliefs, and bodies are holographic. For instance, every strand of DNA in your body has all of the information required to make another one of you. And each of your beliefs impacts the whole by affecting your emotions, feelings, and moment-to-moment choices. If you change a belief, you’ll change your life. Each of the choices you make in each of your seemingly insignificant moments becomes part of the collective holographic model of consciousness. And that is how you and I can play an important role in healing others and creating peace in our world. This information is not new. In fact, the precise instructions for bringing lasting healing to our bodies and peace to the world were described by the Old Testament prophet Isaiah. Earlier I indicated that the Dead Sea Scrolls contain a vast amount of information. Not only do these scrolls (and other recovered texts) link us with our past, but some say they also hold the key to preserving our future. In fact, scholars believe that one document, the Isaiah Scroll, is so critical that in the event of a natural disaster or nuclear attack, it actually retracts into an underground steel-and-concrete-reinforced vault! Among other things, Isaiah shares his vision of modern times. The vision contains two possibilities for our time: a time of peace and healing, and a time of war and destruction. Isaiah told us we could avoid experiencing the darker vision simply by making certain choices about the way we conduct ourselves. He went on to describe a lost mode of prayer we could use to speak to the Mind of God to experience lasting healing and peace. Could there be a forgotten wisdom that was lost in the fire that destroyed the great library or perhaps was altered during the fourth century biblical edits? Gregg Braden provides convincing evidence that there is. Some people think praying involves dropping to your knees and asking for help or blessings. That’s certainly one way to pray, but the truth is, there are many different types of prayers— many of which you may not consider to be a prayer. Meditative Prayer — Sitting quietly, praying without words. Most people in the West use one or more forms of these prayers. However, ancient texts, as well as Gregg Braden’s journeys into the most sacred places on earth today, reveal a fifth mode of prayer. The example of the mysterious reversal of the intended bombing of Iraq offers a clue to the secret of our lost mode of prayer. Several years ago, a man named David stood in the middle of a desert in New Mexico. He stood before a circle made of stones. He had gone to that specific place to “pray rain” because New Mexico was in the midst of a three-year drought with no relief in sight. David slowly removed his shoes, closed his eyes, and with his feet bare to the earth he cautiously navigated his way around the stones. With each step, his naked toes came within fractions of an inch of the outer stones. Never once did he touch them. After David completed the circle, he stopped, straightened his posture, and moved his hands into a praying position in front of his face. After a few moments in this position, he took a deep breath and walked away. That afternoon the weather changed. The rain came suddenly, and soon a full-fledged thunderstorm was under way. It rained all afternoon and into the evening. Now, can we say for certain that David’s prayer played a role in the storms that followed? No. But we can say that the weather in northern New Mexico changed that day. From weeks of drought, failing crops, and dehydrating cattle, in one day the weather shifted to torrential rains that gave way to a pattern of daily showers. And the time between the unexpected shift in weather and David’s prayer was just a matter of hours. The key is to understand that David didn’t pray for rain, he prayed rain. Believe it or not, there’s a big difference between the two. Don’t worry if you don’t immediately understand what that difference is; the Isaiah Scroll left us the precise instructions for using this mode of prayer. And Speaking the Lost Language of God will teach you how to apply Isaiah’s timeless method to heal your life on every level. The first secret comes with understanding vertical time (which is thoroughly explained in Session 7 of the program). It shows you how to claim the experience you want. The second secret stems from understanding that we are holographic in nature (explained in Session 5). The third secret explains what the most powerful moments of your day are. Knowing this secret alone will forever change the way you think about the seemingly mundane experiences in your life (you’ll find this secret in Session 10) . The fourth secret explains that you are constantly in a conversation with the world around you. It shows you how you can change your perspective of actively pursuing your life’s goals to one in which you attract them to you (this secret is also revealed in Session 10). Would you like to know how you can become more conscious of the message you send out to the world? Through a unique blend of state-of-the-art research, extensive knowledge of ancient texts, and personal experience, Gregg Braden manages to unravel some of our greatest spiritual and scientific mysteries: What is my purpose? How can I make a difference? Is there a creative force that permeates the Universe, and if so, how do I work with it to live a better life? How you can access the higher dimensions (the latest research shows that there are at least 10) where lasting healing and peace occur. The four angelic powers that were given to mankind and no other species. How your feelings and experiences relate to Einstein’s Theory of Relativity. What you can do to make a difference in the peace between nations. Why affirmations don’t always work...and what to do about it. How you can directly access three of the four fundamental forces of nature to heal your body. How to get heart, mind, and body coherence so you can consciously speak the lost language of God. You’ll come to realize that you are actually engaged in a form of prayer in every moment of your life. Most importantly, you’ll know how to use that information to live a better life. P.S. Whether you realize it or not, you are constantly communicating with the Mind of God. The question is, are you aware of what message you’re sending. Take control of your moment- to-moment dialogue by accepting this invitation to order the Speaking the Lost Language of God, today! ...We must assume behind this force the existence of a conscious and intelligent mind. I want to have the power to change the course of the events in my life— even those already set in motion. I want to walk away with all the knowledge I will need to make literal commands in the Mind of God. 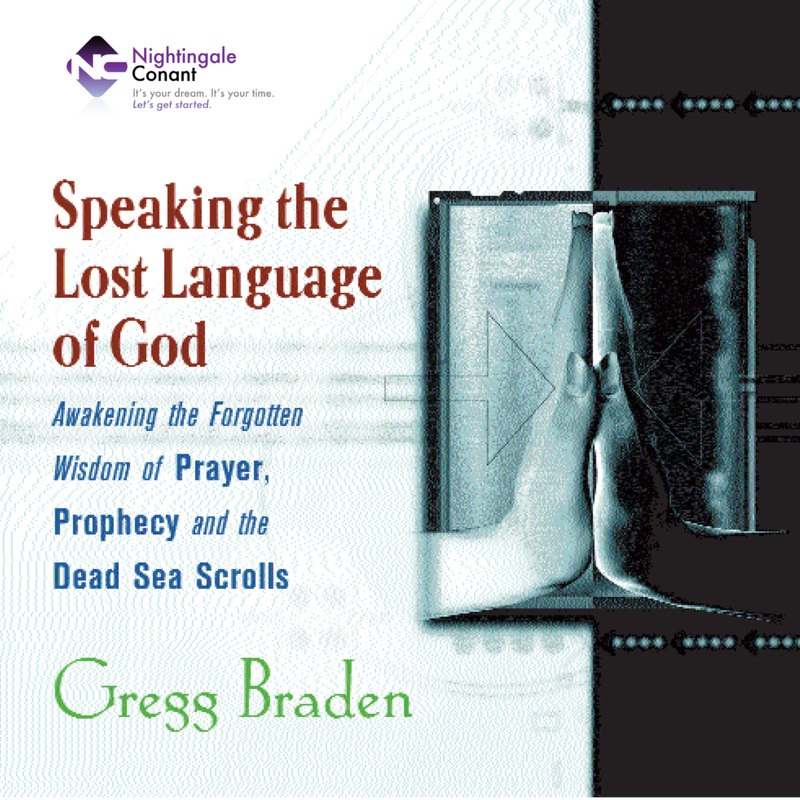 Speaking the Lost Language of God for the special price below. I can select one of two ways of ordering.